Denise Herd is awarded the 2018 Entrepreneurship Achievement Award. Click on the video to watch her speech at the awards reception. While we need more male allies, we also need more women to be allies for women. Denise and Eleanor personify allies for women. Through their speaking on women’s empowerment, both encourage women to share their voices more. Click Here to listen and learn more! 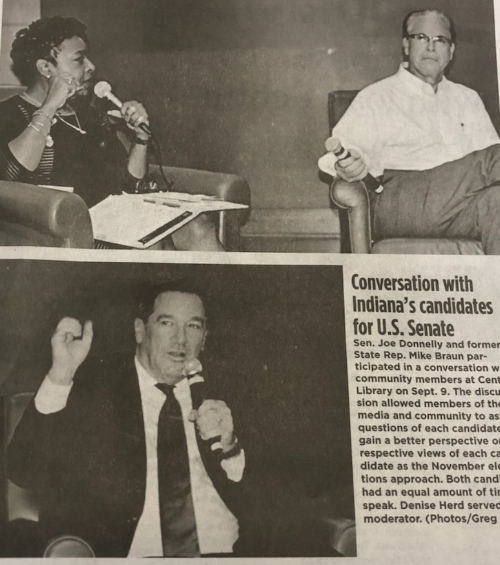 With the November election approaching, the African - American Coalition of Indianapolis invited Denise to moderate a conversation between Senator Joe Donnelly and former State Representative Mike Braun on at the Central Library. Denise appeared on WISHTV Channel 8 "Community Link" where she discussed diversity in public relations, social media and what being business owner in today's competitive environment means to her. To watch, click the video.